Since the birth of Snapchat, we've had an endless number of apps trying to offer new ways to chat with video. One name that you might not think would have any interest in this is Skype, and yet the Microsoft subsidiary has just dished up one of the most intriguing video messaging apps yet. So what of the app itself? 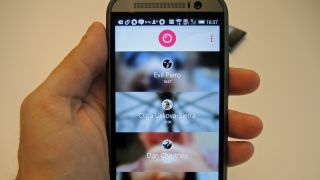 As its name hints, Sky Qik is a quick-fire video messaging service, one that lets you hold group or one-on-one conversations made entirely of short video clips - no text in sight. Each clip you send can be up to 42 seconds in length and can be made from a mixture of capture from both front and rear cameras. Once the clip is recorded it'll automatically be shared to the designated conversion, creating an ongoing thread of short videos that will play back to back for all participants. Qik was built from a small team of designers, and having had the chance to take it for a spin ourselves we can tell you that we really liked the lightweight feel of the app. Setting up an account is easy - you don't even create a profile - and once you're done you're met with a homescreen based entirely of your active chats. When you add people to a new chat, the app pulls up your phone address book. You'll record a message and send it, and if the recipient doesn't have the app they'll get a text telling them that a message is waiting for them should they want to go download Qik. "While there are many apps, not just Snapchat, that share video messages in some form, none of them make it the star of the show and are designed to have entire conversations on video,"said Pierro Sierra, Skype's Director of Product Management. "We have video messages on Skype, and those are three minutes. And that's because the use case there is 'I made a phone call, you didn't pick up, I want to leave you a video message'. So it's a replacement for what would have been a 45 minute call. This is different, this is like, we just want to chat. Express yourself, capture the moment, see what's out there and have a conversation out there." And if you're feeling lazy or don't feel like recording a clip, Skype lets you send out generic video responses called Qik Fliks instead, which you can pre-record (though you get a cool dog in shades to start with). In light of the recent Snapchat and Apple Cloud leaks, privacy and security are hotter topics than ever. By way of response to these concerns, Skype Qik will delete all video clips after two weeks, and should you wish to delete any clip you've sent, you can do so easily and the video will vanish on any device it was on. We tried deleting a video we'd sent out and were happy to see that it only took a second for it to be wiped from all participating devices. Qik will be available on iOS, Android and Windows Phone, launching on all three today - and yes, it's completely free.